Leaves are glowing yellow, orange and crimson – and so are the beautiful squashes and carrots fresh from the earth. Why not make a batch (or two!) of this soup to eat part of this healthful rainbow? It’s abundant in nourishment for the body and soul. Heat oil in 3-quart heavy soup pot over medium high heat. When hot, add green onions. Cook until tender, about 3 minutes, stirring often. Add sweet potato, carrots, broth and water. Bring to boil. Simmer covered, until veggies are very tender, about 25 minutes. 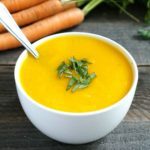 Puree soup with immersion blender or in batches in blender or food processor, until smooth. Season to taste with salt and more sesame oil. Delight in the warming nature of this soup, whether it be for lunch, breakfast!, or dinner.